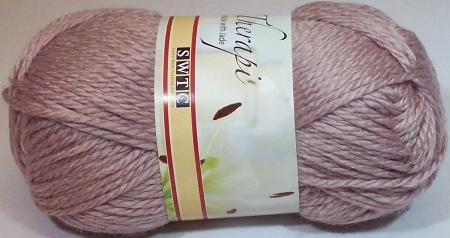 1.75-oz (50-gram) balls of SWTC Therapi yarn. Each ball contains approximately 109 yards. 30% Bowlder (Jadeite) Fiber, 50% Fine Wool, 20% Silk. 20 stitches = 4 on US size 7 knitting needles. Bowlder is designed with a honey comb structure which allows the fiber to be comfortable for summer wear and warm for all weather wear. Jade has been known to man for over 7000 years. It is revered for its toughness and natural beauty. In China, Jade was known as Yu, the royal gem and was comparable to gold and diamonds in its value and status. Today, Jade is a symbol of the good, the beautiful, and the precious. Some believe Jade is a healing stone; others seek it out for good luck. It is treasured throughout the world as a symbolic stone of love, inner peace, and harmony. SWTC INC brings it to you as yarnTHERAPI. Made from Jade and other mineral materials, the Bowlder fiber is made in very high tech process similar to that of SOYSILK brand fiber and other earth friendly fibers that SWTC has introduced.